With summer slowly coming, so does the desire for cool summer treats such as ice cream! As with my Strawberry Ice Cream, this is a creamy snack that I figured out how to make soon after my food allergies were realized. I have always enjoyed making ice cream cakes, especially my Black Forest Ice Cream Cake. Making dairy free ice cream was inevitable! Puree all ingredients in food processor. Then blend mixture in frozen ice cream maker ** for twenty minutes. Will be consistency of soft ice cream. For convenience, I put into small individual containers and freeze. When you want to eat the ice cream, take a container out of the freezer for 10-15 minutes to soften. 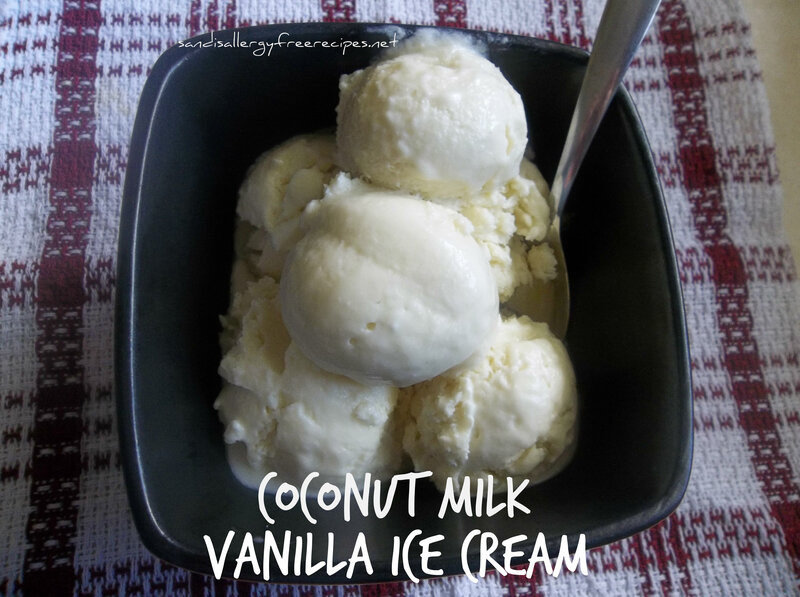 Why not to your ice cream with Whipped Coconut Cream! **If you don’t have an ice cream maker put bowl of mixture into the freezer and stir every thirty minutes for a few hours. 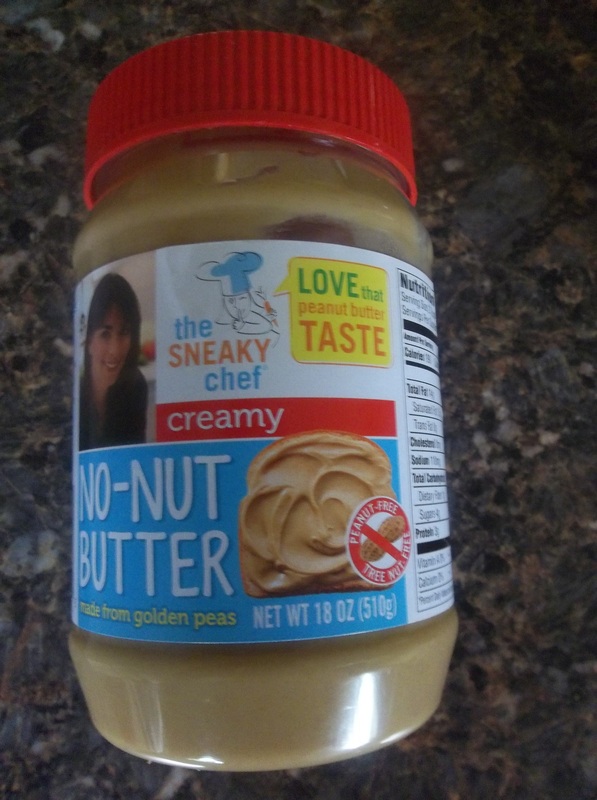 The No-Nut Butter is made of golden peas and is peanut, tree nut, and soy free… It is creamy and tastes great! Everyone in my family loves it! 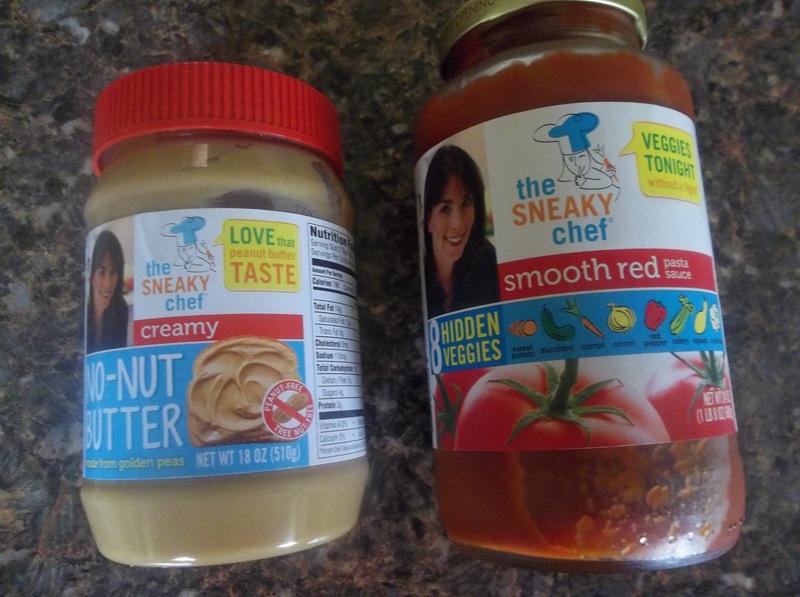 It’s a great alternative to a nut butter! 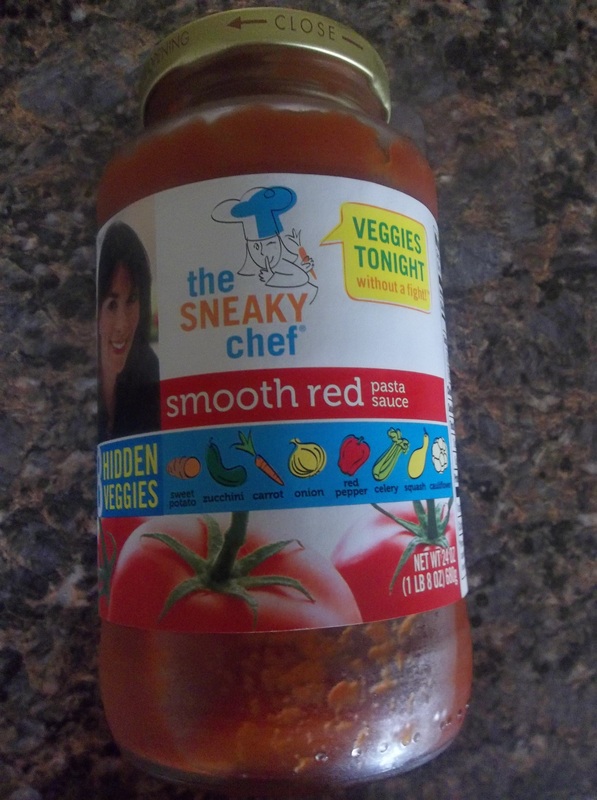 The Smooth Red Pasta Sauce is full of eight “hidden” veggies; sweet potato, zucchini, carrot, onion, red pepper, celery, squash, and cauliflower, as well as tomatoes. The flavour is a nice blend of spices. It doesn’t need any extra spices or flavours added to it, unlike other commercially made pasta sauces. This one is great straight out of the bottle! If you are already signed up then send me an email to enter! Sorry due to the company being in the US, this contest is for US residents only residing in the US. The giveaway begins June 10th, 2013 ends June 17th, 2013 at 11:59 pm. Just as I did with Cinnamon Sweet Potato Frosting, with this frosting I was aiming for a light, low fat icing. I still remember when a coworker first told me about a recipe she had seen with brownies and sweet potato icing. She was going to bring in the recipe for me to see, but I told her no thank you. You see when I see a picture or hear of a food I start getting inspired you thinking. 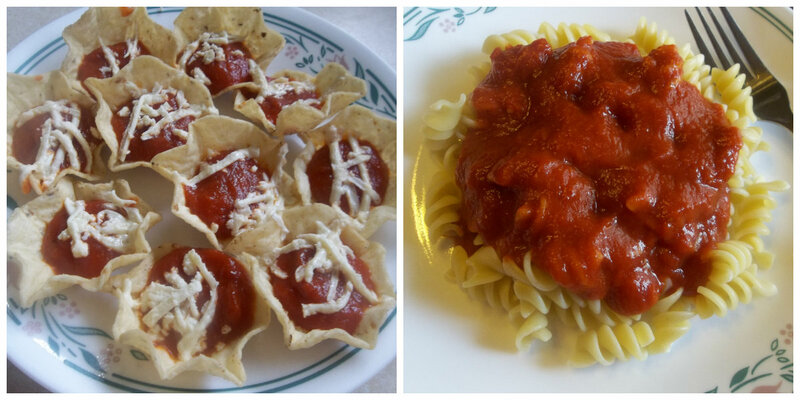 I really enjoy figuring out how to make foods work together without seeing someone else’s recipe first. 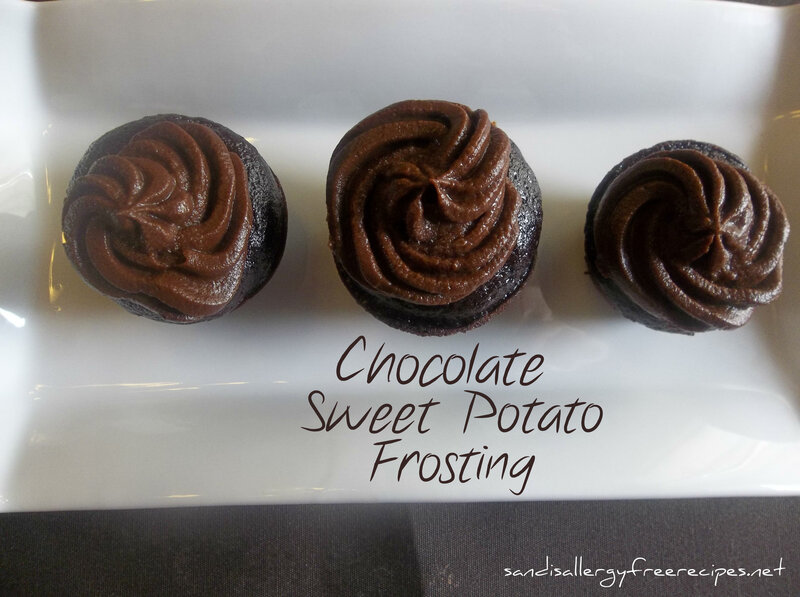 I was intrigued… Hmm sweet potato as a base for an icing. It almost seems as though there is a ping pong ball bouncing throughout my head with lovely ides and combinations that work well together. This icing is so lovely. Light and fluffy enough to fool anyone… No one would every know how good it is for you! One of my taste testers, (who has no food allergies) even asked me for the recipe before it was posted so she could make it for her birthday cake. 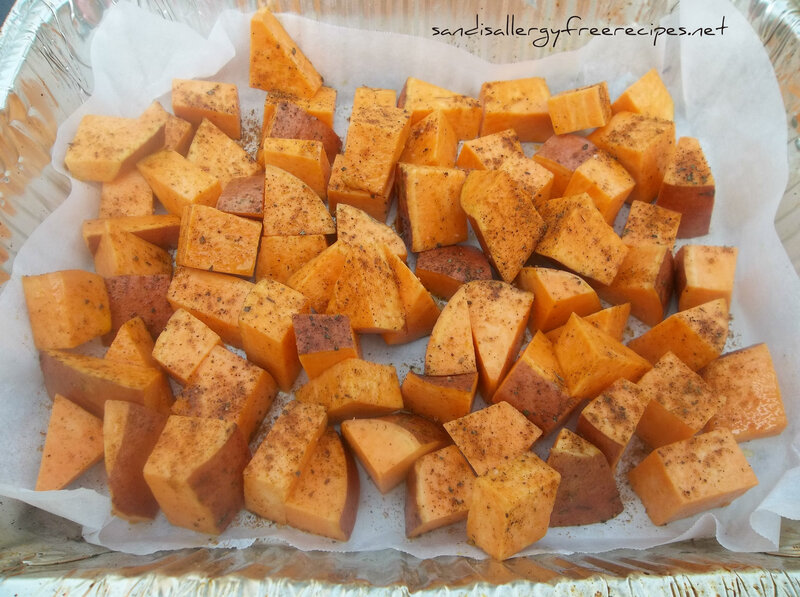 Whip cooked, cooled sweet potatoes with magic bullet, ninja or food processor. Add remaining ingredients and mix well. 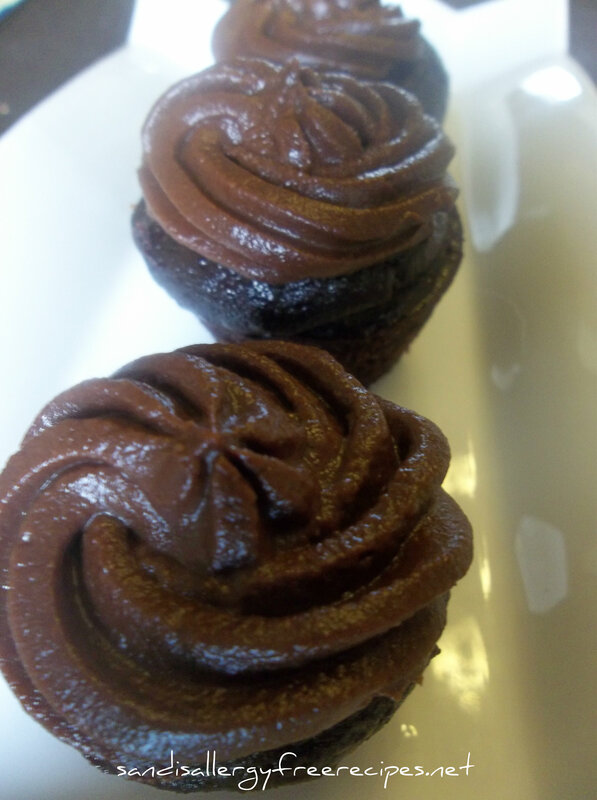 This frosting is shown on mini chocolate cupcakes. This is a simple post and one that I didn’t really plan on posting. I don’t really think about posting easy vegetable side dishes. I did however have some emails, so I will be obliging. 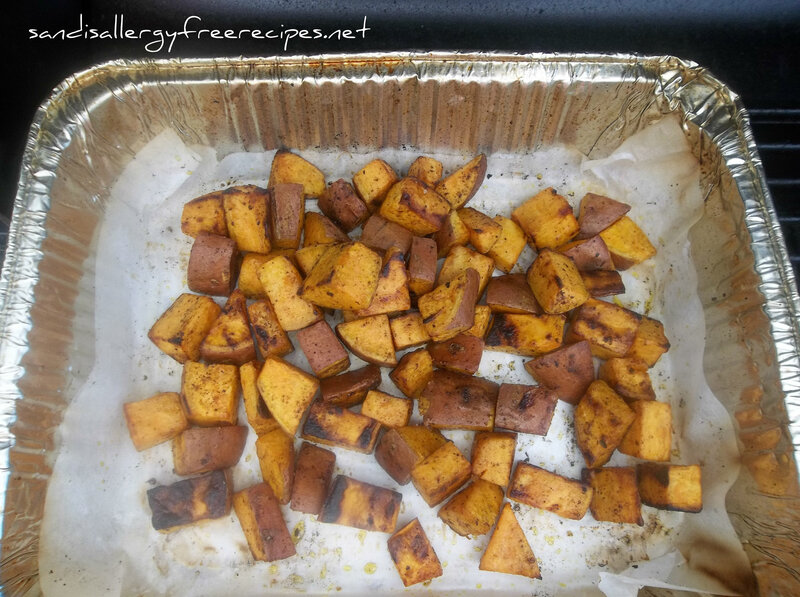 I use sweet potatoes in many different ways… Apple sweet potatoes (which I will post at a later time), Cinnamon Sweet Potato Frosting, Chocolate Sweet Potato Frosting and other recipes I am playing with and by roasting them. 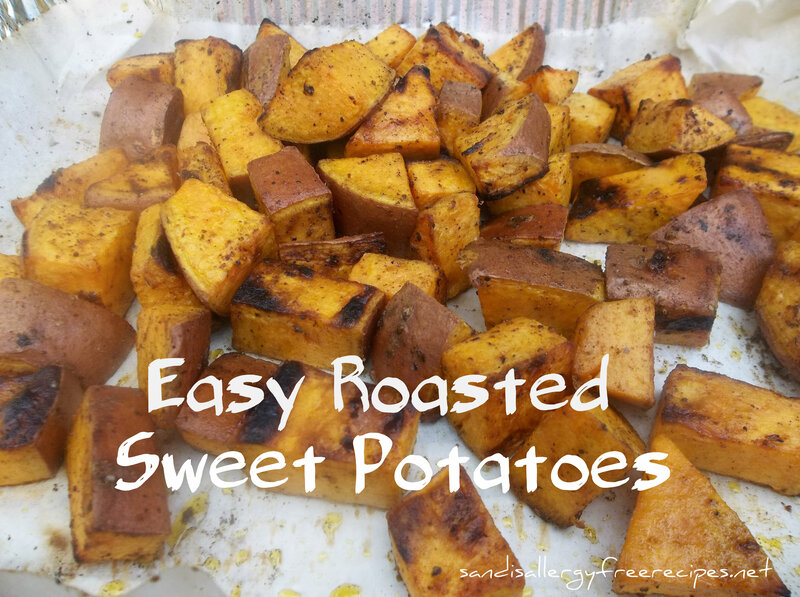 Roasting is super easy way to be able to enjoy them whether you are cooking them in the oven or on the barbecue. Toss potatoes and olive oil into a bowl and stir so that the potatoes are evenly coated in oil. Sprinkle on spices. Cook uncovered for 35-40 minutes, stirring twice through the cooking process. **If barbecuing, cook on low heat, stirring more frequently, approximately same time. Test doneness with a fork. 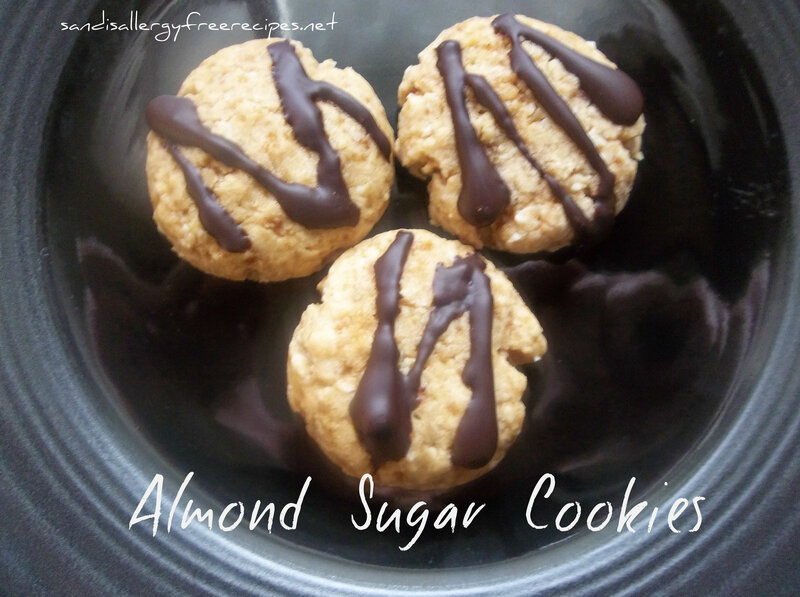 So if you don’t have time or don’t want to go through the fuss of rolled out sugar cookies, these will work out great for you. All the taste of rolled sugar cookies, but much less work. Cream the shortening and sugar together. Mix in egg and extract. In another bowl whisk together flour mix, xanthan gum, and baking powder. Add dry ingredients to creamed ones and mix well. 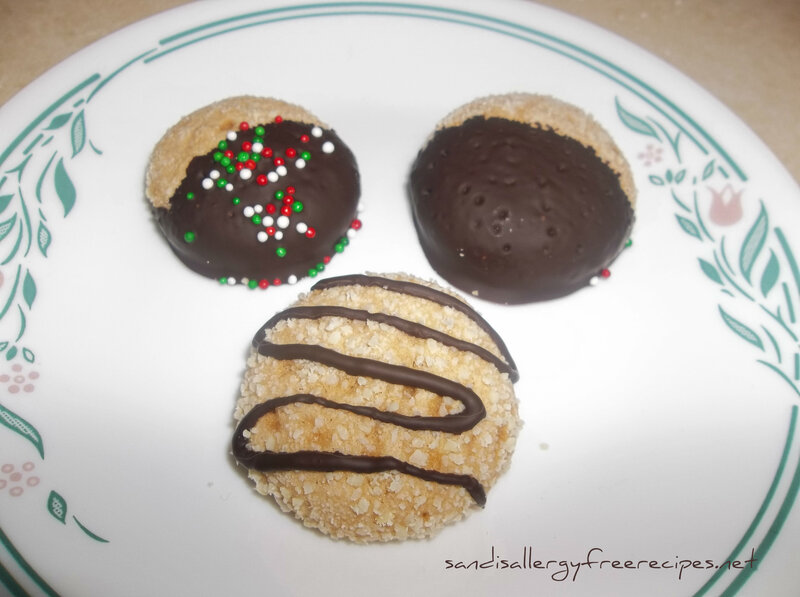 Roll into small balls and roll into the almond flour and place onto parchment paper lined cookie sheet. Then flatten the rounds down with a fork. Bake for 7-9 minutes or until cookies are just golden. Let cool.Melt the chocolate in a double boiler. Then you can either dip the cookies into the chocolate or drizzle the chocolate on them. Keep in sealed container for up to five days. They also freeze well. 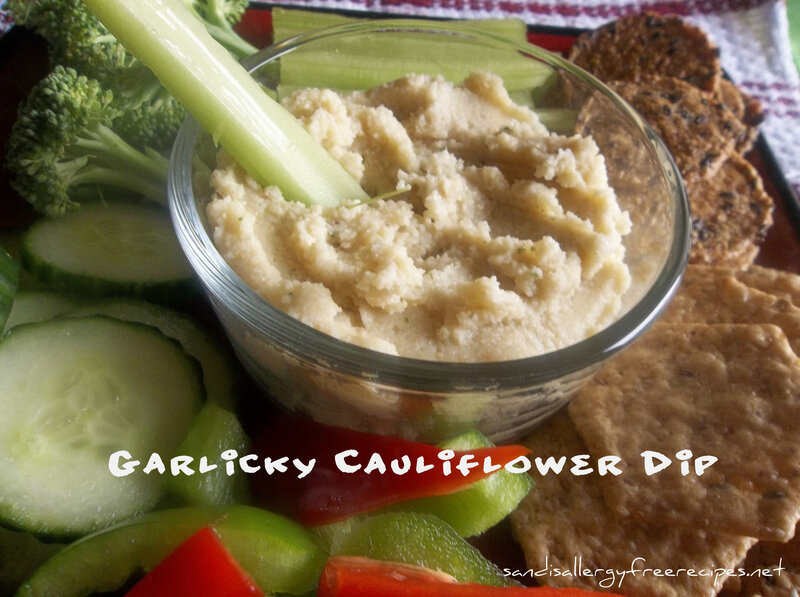 Since I made my Cauliflower Crust Pizza, I have been really playing with cauliflower to make different recipes. I am really enjoying the versatility of it! 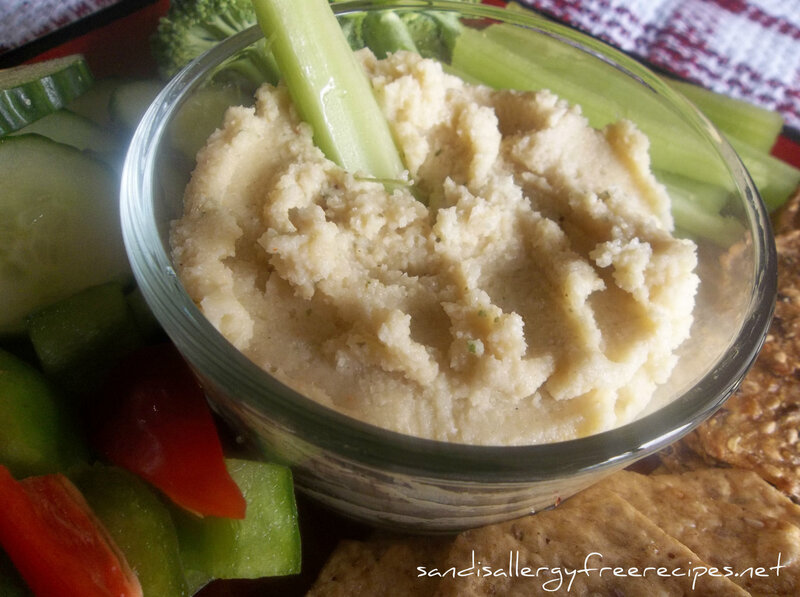 Being dairy free, I was getting somewhat frustrated with my options for dips. I have made Chili Cheese Dip and Bean Dip as well as flavouring my Cashew Cream several different ways. This is just a new fabulous option!! I have made this recipe several times and several ways. This is the best dip yet!! Put cauliflower, onion, olive oil, mustard powder and cayenne into a two quart casserole dish and mix thoroughly. Roast for twenty minutes. Add garlic and stir. Roast for another twenty minutes. Take out and let cool. After cauliflower mixture has cooled put it in food processor, add beans and pulse. Add one tablespoon of water at a time to make a smooth consistency. Keep in a covered bowl in the fridge for up to five days. Make approximately 6 cups. ** You can use any white cooked bean. 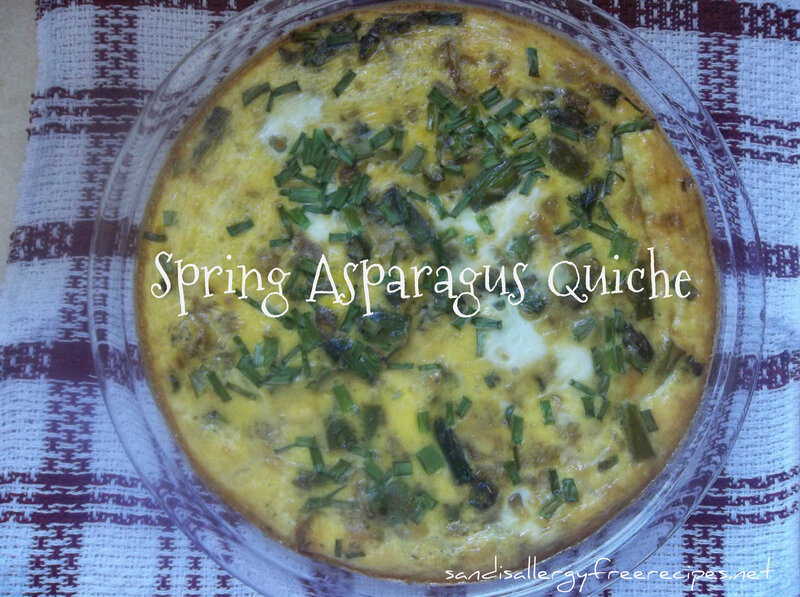 Spring has sprung and so has Asparagus!!! 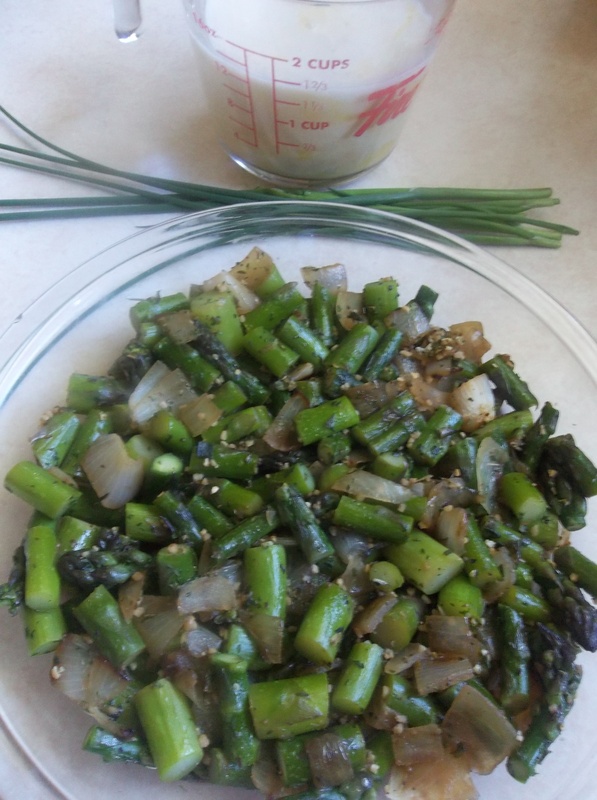 In a medium frying pan saute asparagus and onion in olive oil on medium heat for five minutes; add garlic and cook for one more minute. Pour into 9 inch pie plate. 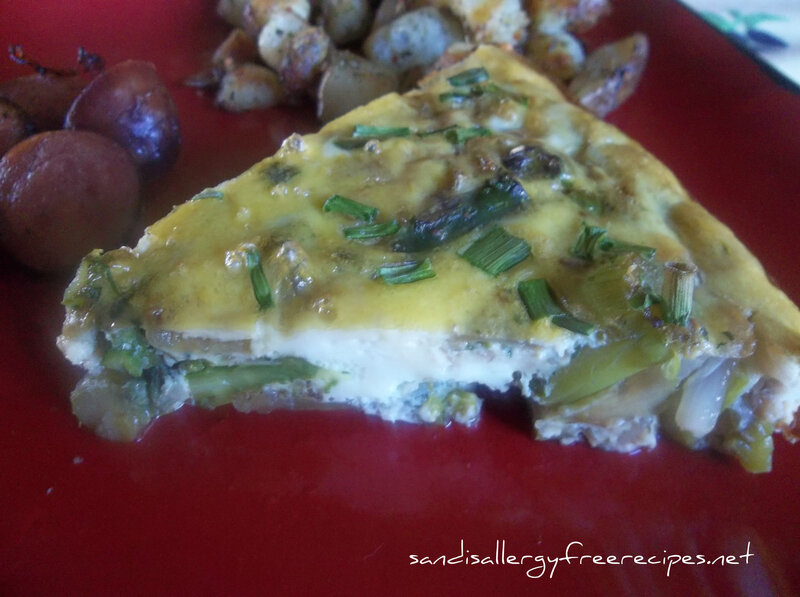 Break eggs into a bowl and beat with a fork; pour on top of vegetable mixture. Add milk, salt, pepper, chives and cheese if using. Stir lightly to combine all the ingredients. Bake uncovered for 35-45 or until eggs are set. ** This time I did not use any cheese. Still tastes great!